This story originally appeared in our June 2018 issue. Read the first part of our Saudi Arabia feature here. With so many large-scale projects going up and wholly new urban areas in development, it can be hard to keep track of the myriad established architecture offices working across Saudi Arabia. Here is a quick guide to some of the biggest, tallest, and most cutting-edge projects in the works across the country. Snøhetta’s King Abdulaziz Center for World Culture is the by-product of a design competition led by the Saudi Aramco Oil Company, which wanted a new knowledge incubator for Saudi Arabia to symbolize the nation’s aspirations for a diversified economy. The one-million-square-foot complex will feature a 930-seat Grand Hall as well as a cinema, library, exhibition hall, museum, and archive, among other offerings. 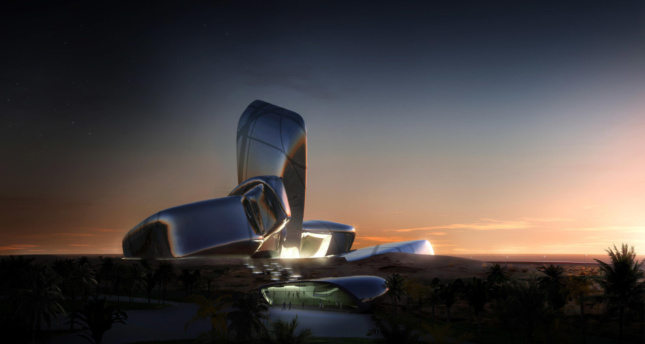 The desert-bound structure is designed to resemble a series of stacked pebbles clad in parallel bands of metal piping. Inside, these give way to graphic, linear patterns that reveal a delicate metal structure underneath. Meanwhile, the Grand Hall’s ceiling is wrapped in perforated copper panels. 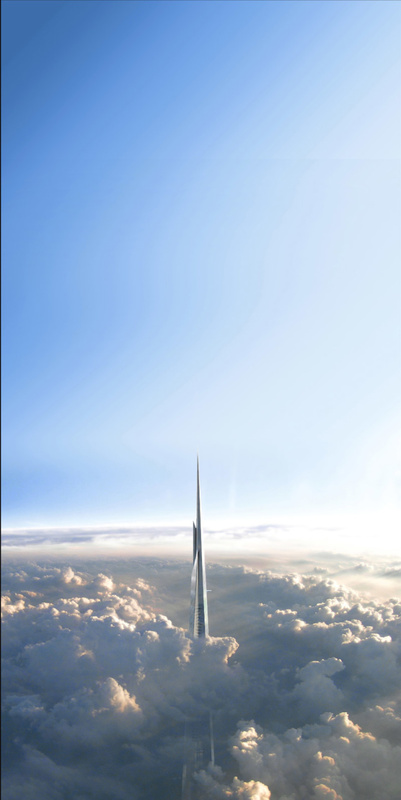 When completed, Adrian Smith + Gordon Gill’s 3,280-foot Jeddah Tower will stand as the tallest building on Earth. The organically shaped pinnacle will be the focal point of the Kingdom City development (population: 210,000), a forthcoming $20 billion economic area master planned by Berkeley, California–based Calthorpe Associates for Saudi Arabia’s west coast. The tapered skyscraper is structured to mimic desert vegetation and is built with petal-shaped apartment blocks at its base. 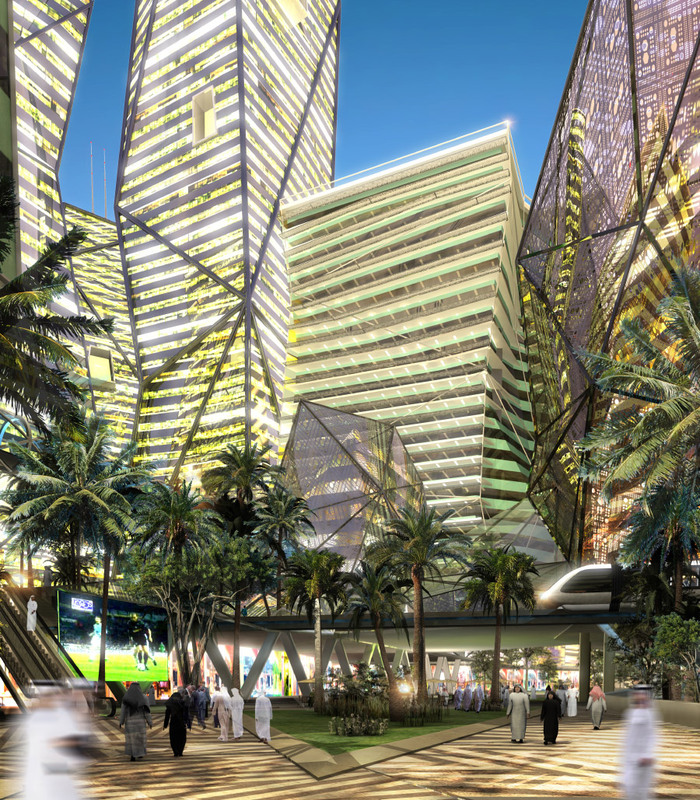 It will also contain a hotel, commercial spaces, and a variety of observation platforms above. 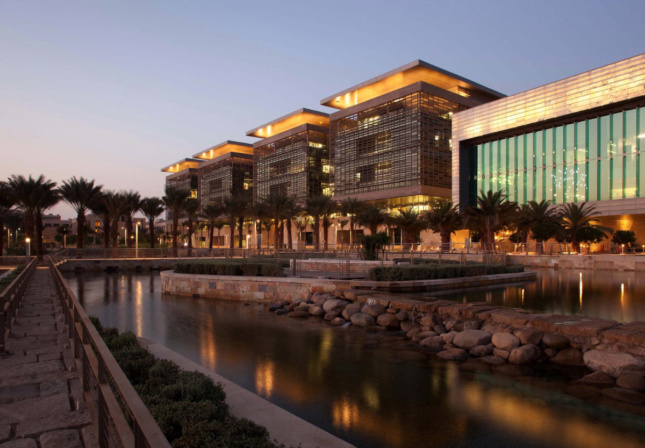 In 2009, St. Louis, Missouri–based HOK designed and built an 8,900-acre campus for the King Abdullah University of Science & Technology in Thuwal, Saudi Arabia, in just over 30 months. The 940-student university contains some of the most advanced scientific lab equipment in the world and features 5.5 million square feet spread across 27 buildings, including two million square feet of laboratories. The labs are arrayed across four 500,000-square-foot structures designed to be “flexible building shells” with universal floor plates that can accommodate different lab setups. The structures are wrapped in horizontal metal louvers to control for glare while the campus library is faced with translucent stone cladding that casts light from within at night. 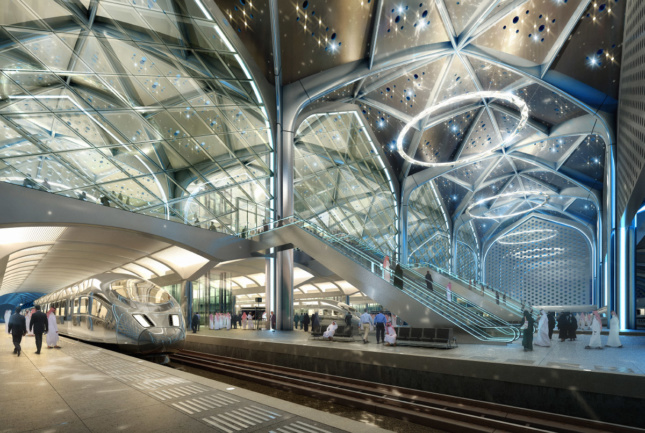 Foster + Partners and BuroHappold are working on a series of transformative high-speed rail (HSR) stations across the country as the Saudi government pushes to boost regional connectivity with a new 280-mile-long HSR line with stops in Medina, Mecca, Jeddah, and the King Abdullah Financial District. Designs for the stations are meant to seed new urban areas in each locale by fusing cavernous, 85-foot-tall arched interior spaces with strategically-placed solid facades to limit solar gain, overhead bridges to create covered outdoor spaces around the stations, and direct connections to the country’s most bustling cities. The line is expected to open sometime this year and will carry 135 million passengers per year by 2042. 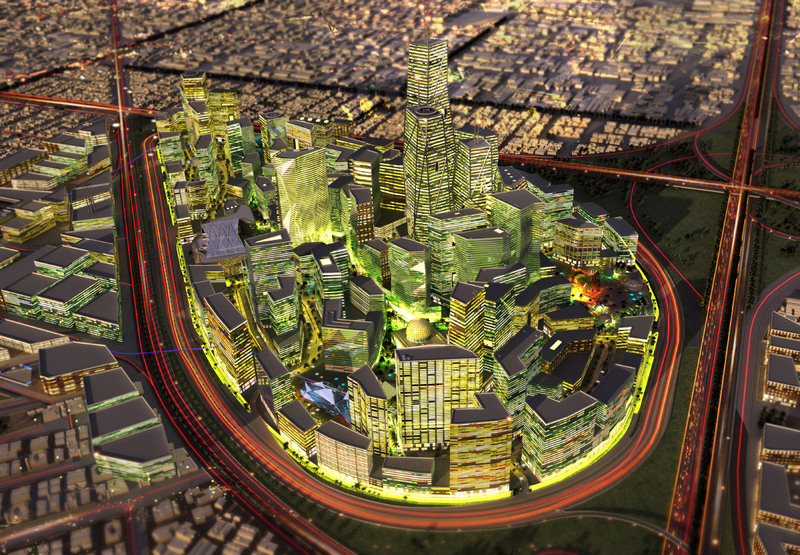 Danish architecture firm Henning Larsen has master planned a new business district on the northern edge of Riyadh, where 59 high-rise towers are now in the works. The firm took inspiration from the city’s historic center when calibrating the positioning of each of those towers, generating a taut, tall cluster of angled and closely set monoliths. The arrangement is designed to minimize solar penetration into the city, resulting in ambient temperatures—the designers hope—up to ten degrees cooler than surrounding areas. The massive, nearly complete development area has been in the works for years and features contributions from SOM, CallisonRTKL, Gensler, Foster + Partners, and many others. Zaha Hadid Architects (ZHA) recently completed the 750,000-square-foot KAPSARC (King Abdullah Petroleum Studies & Research Center) complex, a nonprofit research institution focused on “policies that contribute to the most effective use of energy to provide social well-being across the globe.” The honeycomb-shaped complex is designed to optimize solar and wind orientation and is made up of five buildings clustered around a series of interlocking courtyards topped by metal canopies. The complex, which opened earlier this year, was one of the final projects Hadid oversaw. 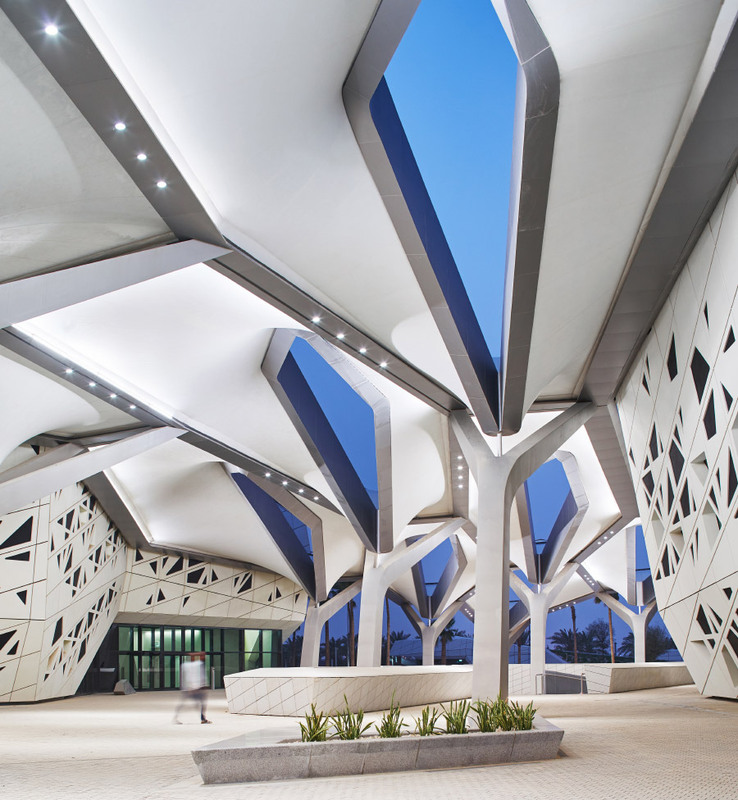 Among other features, it includes a 300-seat auditorium, a library with 100,000 volumes in its archive, and an inspirational prayer area called a Musalla.